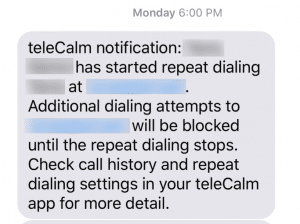 Notifications-You will also select if you want to receive notifications when your loved one starts placing repeated calls (see below for more info). If you chose, you may receive a text notification when your loved one starts to place repeated calls to the same contact. An example of the text is below. What Does this Mean for My Loved One? When the repeat dialing feature is active, and your loved one calls her friend Sue too many times, the call will not be completed. Your loved one instead will hear a message stating that Sue is not available, and to try back later.